On border between North Macedonia and Albania lies one of the oldest and deepest lakes in Europe. Ohrid is one of those places that are still not fully packed with tourists and which bring peace and serenity. Often described as ‘one of the most beautiful places on the Balkans’, its charming towns and villages lie on the crystal clear waters surrounded by picturesque mountains. 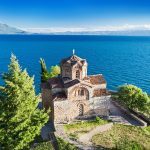 If visiting Ohrid is one of your future plans, here are the ways how to get there and the most important information you should know. By car: If arriving from the direction of Skopje, there are two options: you can get to Ohrid via route E-65 that leads directly to town Ohrid via Tetovo, the other one is via E-65 then E-75, passing through Petrovec, Gradsko and Bitola. The ride between Skopje and Ohrid takes around 3 hour, 20 minutes more/less depending on the route. Via route SH-3 you can arrive from the Northwest and Southwest directions from the lake, taking you to the western side of Ohrid lake. By train: Railway system of North Macedonia is well-developed and connects most of the bigger cities and places in the country. On the North, it is connected to Serbia and on the South to Greece, so the busiest route is Belgrade – Thessaloniki, via Skopje. Still, there is no direct Skopje-Ohrid route, the closest station is in Bitola from where you must continue by bus or taxi, so maybe you don’t want to consider this mean of transport. By bus: Getting around North Macedonia by bus is the most common mean of transport. It is possible to get on Ohrid main bus station from several directions. The most common route is Skopje – Ohrid with several departures per day and the journey takes around 3 hours. If arriving from Bitola, there are also regular departures on a relation Bitola – Ohrid. If arriving from Albania, there is a route Tirana – Ohrid, travel time is around 3-3,5 hours. In case of arrival from other countries such as Greece, Serbia, Montenegro etc. the option is to get to Skopje main bus station and continue your journey to Ohrid. From Ohrid Airport: The airport is located less than 10 km from Ohrid town and there are only shuttle bus lines that coincide with flights from WizzAir company, so the most accurate information can be checked with the company. Besides that, there is no train or bus line to the town so you should consider a private transfer or taxi which might cost around 500 MKD (8 €). 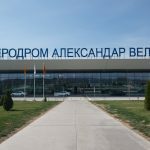 From Skopje Airport: Unfortunately, there is no bus or train from Skopje airport to Ohrid, you will have to get to Skopje main bus station and continue your journey to Ohrid. St. Jovan Kaneo is one of the most photographed sights on the lake, but also a place from where the most amazing view stretches. Sitting on a cliff, this Byzantine-style monastery became a symbol of Ohrid. 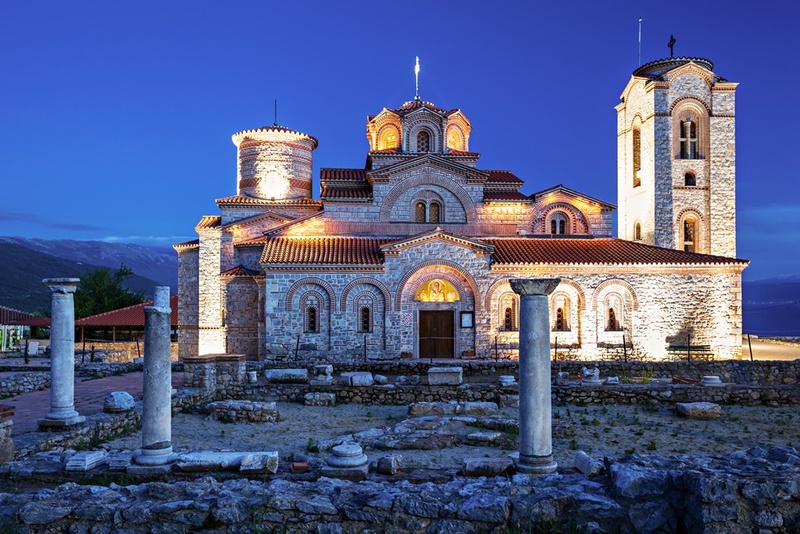 Ohrid is known for its churches, actually 365 churches for each day of the year. Today, their number is significantly smaller but the ones which are among the most attractive ones are St. Clemens Church and St Sophia Church. Another landmark of Ohrid is Samuel’s Fortress, climb up to the once a capital of the First Bulgarian Empire and walk around the walls. Visit two museums and get to know the history of the area; National Museum in the Old Town and Museum on Water, a reconstruction of the old settlement with exhibition of the animal relics found in this area. You can take a boat taxi to one of the most popular day trip destinations, Monastery of St. Naum which lies on the lake shore providing amazing view. St. Naum was buried inside of it and, the legend has it, you can still hear his heartbeat inside. While there, you can take a boat tour across the river Drim. Discover Ohrid bazaar with various shops and cafes, and if you’re looking for something really authentic, search for Ohrid pearls, not expensive as it sounds but could make a perfect gift for someone. Unfortunately, many try to sell fakes, but the real ones made of placid fish are surely in property of the family Talev. Depending on the time of the year, swimming and sunbathing is an excellent activity during the summer. In the autumn and spring cycling is highly recommended since Ohrid has a great network of paths for hiking and cycling. National Park Galicica is situated right between the lake Ohrid and lake Prespa, dedicate a day to unspoiled nature, clean air and some good hiking. Discover the rich flora and fauna of the mountains and enjoy the tranquillity. Mountains around the lake Ohrid are reaching over 2000 m, so there are plenty options for hiking. Besides the routes in National Park Galicica, trails can take you to charming mountainous villages such as Velgosti and Elshani. Note: All churches have entrance fees that can vary from 1-10 €, boat rides usually cost 5€ per one way. 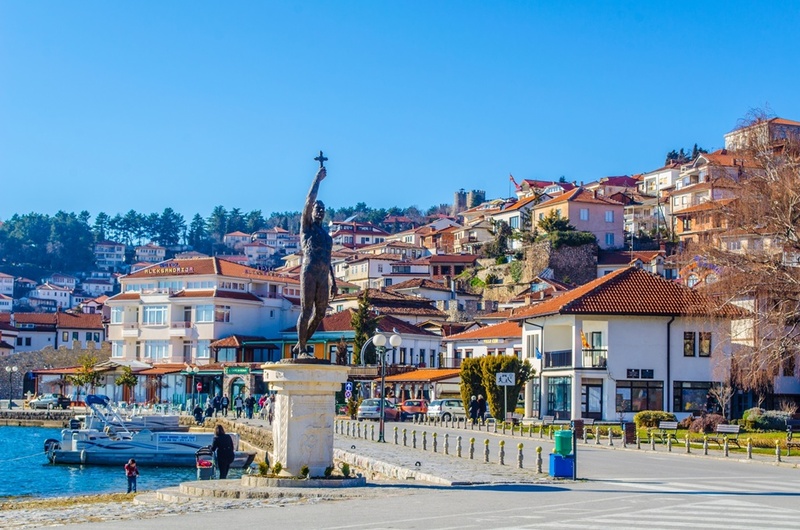 If arriving to Ohrid from Skopje it can be visited as a day trip regarding the frequency of the routes, but to thoroughly explore the area it would be good to stay a little longer, at least 2-3 days. There are plenty activities on offer such as hiking, swimming and cycling, as well as many interesting sights. Although a bit crowded during the peak season, post and pre-season are surprisingly peaceful. So, if you would like to find a good swimming spot in September, some of the best places are Struga beach, below St. Naum and spots in National Park Galičica. Ohrid has a mixture of Mediterranean and country climate, that is why winters are never too cold and summers are never too hot. According to that, the best period to visit Ohrid would be from May to September when you can expect the good weather. In autumn, there is a lot of rain, and winter is rarely with snow. 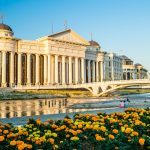 Have in mind that for most European tourists, North Macedonia is a very affordable country. Basic lunch outside can cost 5€ and a beer in a bar costs around 1 €. In the end, it is good to mention that North Macedonia uses Cyrillic alphabet, which would be useful to know in case there is no Latin translation. It is definitely better to stay overnight in Ohrid than to make it as a day trip, as we already stated. There are plenty of hotels and apartments to stay at such as Hotel St. Naum, Hotel City Palace or Villa St. Sofia. 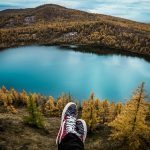 If you maybe prefer to stay in the nature, consider camping which is available in several campsites such as Rino, Andon Dukov, Elshec, Ljubanista or Gradiste.